Whilst our Northern Hemisphere friends are freezing through the silly season, Australia is sweltering. So naturally we want every ice cold drink there is. And bulk ice-cream and icypoles. And we preferably like to enjoy these in the comfort of a pool and / or air conditioning. Summer – it gets us every time! We also seem to be incapable of talking about anything else but how damn hot it is! Cause it is just SO HOT! This might help clarify why you’ve been seeing so many popsicle recipes from me lately! I’m just trying to get through summer, especially when my ovens always on and my house is a literal hot box! 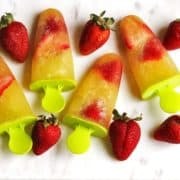 And after making my strawberry mango popsicles and strawberry banana popsicles recently, I decided I wanted to make a special popsicles just for us adults. 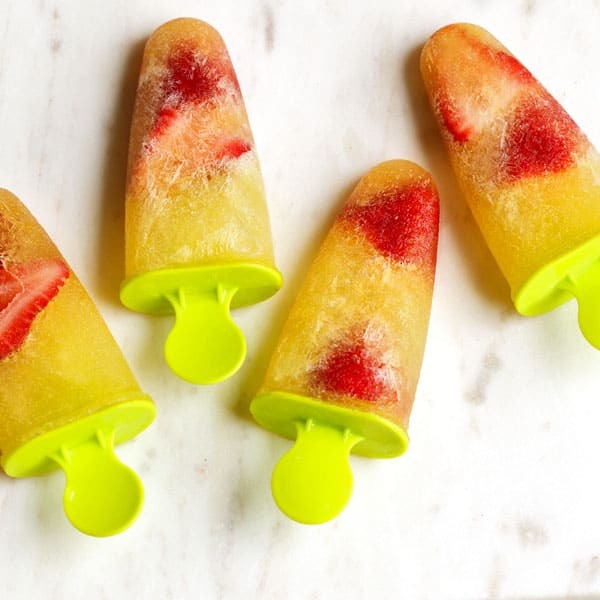 More specifically – mimosa popsicles! Considering that a standard glass of champagne is all that goes into 6 of these popsicles, consuming a couple of these popsicles would be classified as responsible drinking! And at this time of year, where Christmas and New Years and all the parties in between are happening, I’m going to hazard a guess you might have some leftover champagne in the fridge that would be perfect to make up a batch of these! Just be sure to choose your orange juice wisely! Don’t go for the sugar filled rubbish and pick one that is as close to just plain juiced oranges! Here in Australia we have a brand called Nudie Juice who make a juice that’s just 10 & a half oranges (and that’s it). You could even make your own which would be even better. As far as champagne goes – if you like the taste of it, use it! But if you don’t, it won’t taste better in these popsicles. I’ve tried and it did not go down well! I’d love to know how you go making these, so make sure you are tagging @BeForeverHealthierBlog in your festive Instagram snaps!! Go on… pin it for later! You know you want too! This idea is brilliant! Why haven’t I ever done this before?! Thanks for sharing, can’t wait to try this recipe. Perfect New Year’s Eve treat! I’m so excited to try! Now I’m going to find out what an acceptable amount of these to eat are because hey I’m not drinking them ahaha. Only kidding, maybe. But they look so pretty and colorful! Thanks Karlee! Haha I love it! Oh, wow! These look so good. The color so cheery! I need to try these, I love every version of any mimosa! Looks super simple to make too! So excited to try these out!! Bring on summer in Melbourne! Awesome! Hope it’s a hot one for you guys! Ooh, I do love mimosa popsicles – just not in winter. Yeh you must be freezing over there! Nice! Although I have heard you guys have been getting some cold days this winter! I’ve never tried mimosa popsicles before and not in winter. I really like the fruity color. Definitely a perfect treats for hot summer days. Even though I’m not a big drinker, I’m sure I could eat a batch of these in record time. Plus, they’re absolutely beautiful. What a perfect warm weather treat. These look delicious! I am in the northern hemisphere, but I’m in SE Texas and heading to SW Florida tomorrow where the temps will be in the 80s. We are always warm at the holidays as well, but I love it because I hate the cold! That sounds like a perfect temp for Christmas! What leftover champagne? LOL! These look delicious! And I don’t care that it’s freezing at the moment, I would totally make a batch of these in the middle of winter. It’s a fun idea for NYE too. Haha yep leftover champagne might not be a thing! Oh my goodness this is an amazing idea. I love mimosas! Oh my gosh! These look amazing! Even though it’s cold here in Virginia, I still crave popsicles sometimes! They’re just so refreshing. But mimosa popsicles- YES PLEASE!! I also love the idea of making your own orange juice. So easy and healthy! This sounds delicious! Nothing better then a good ice block in summer! Oh wow these look divine!!! Perfect for Christmas!